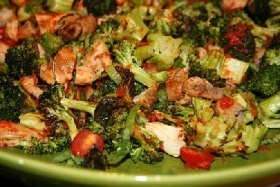 Have you made Broccoli Sesame Salad? 1. Wash broccoli, discarding leaves and toughest part of stem. 2. Blanch entire head in boiling water for one minute. 3. Rinse under cold water. Break off florets and cut remaining stem (peeled, if desired) into 2" pieces. 4. Preheat oven to 450 degrees. Pour olive oil onto a baking sheet. 5. 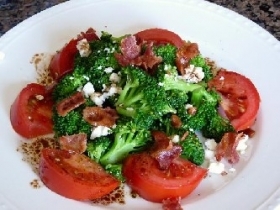 Spread broccoli pieces in one layer, turning to coat with olive oil. 6. Roast at 450 degrees for 5 minutes, turn broccoli pieces over, and continue roasting until broccoli begins to brown, about 5 minute more. 7. Whisk together soy sauce, vinegar, and sesame oil. 8. Stir in 3 tablespoons sesame seeds. 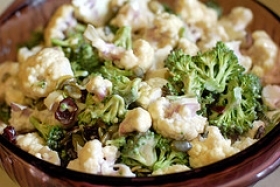 When broccoli is done, transfer to a bowl and pour dressing over it, stirring gently to coat. 9. 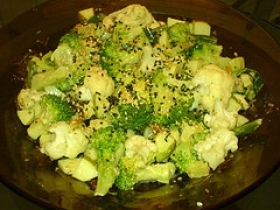 Sprinkle with remaining tablespoon sesame seeds. 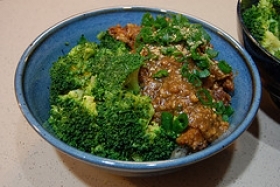 This recipe contains potential food allergens and will effect people with Soy, MSG, Rice, Sulfites, Sesame Seeds, Alcohol, Olive Oil allergies.